Working in the digital world has a thrill of its own. Unlike other, more established forms of communication, the digital world is a dynamic, constantly evolving beast. The good part is that the stake holders in the digital world have the power to change and shape this world. The downside? A higher risk of failure and not-meeting-expectations. 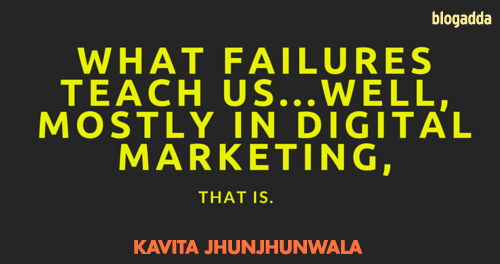 Failures have something to offer too, as Kavita Jhunjhunwala tells us in the guest post below. Kavita curates as well as hosts Click Asia Summits. An experienced digital marketer and event enthusiast, she was keen to bring in an event in Asia that looked at digital marketing challenges from within the industry and would bring the fraternity together to discuss practical solutions. With multiple successful events to Click Asia Summits’ credit, Kavita and her team are looking for new innovative formats for the subsequent editions. Click Asia Summit 2016 is a digital transformation conference to be held at Taj Lands’ End, Mumbai on the 21st and 22nd April, 2016. BlogAdda is proud to partner with Click Asia Summit this year! Sure, they are disappointing. And their short term impact might not be the most pleasant thing to think of. But like so many have said before, failure is a great teacher. In a way, failure also tells you how much you can stretch the rubber band. a) If there’s one thing you forget to pivot, its your content. There is a kind of safety net that exists in marketing communications when done formally. You cannot go wrong. However, in the digital space, you can definitely get lost. And get redundant, if you don’t experiment with the content. Being predictable with the content, in any form, will lead to glassy-eyed readers, reduced number of eyeballs and loss of influence, voice and so on. It’s a kind of content doomsday which afflicts most of us till we shake ourselves and…pivot. One too many times we have seen insane amount of media buying being thrown at mediocre campaigns. Just because it feels safe to do so. It makes you feel like you are doing ‘something’. This is no different from media buying in the traditional mode. That’s why we made clients move to digital, remember? Because it was not working? And now out of habit, we are back to the same old same old. c) Suits just can’t market to jeans, or shorts or whatevs. How often have you seen a post about someone wanting to ‘Learn how to snapchat like a teenager’? Yup, that’s what I mean. If you are looking at age-relevance, bring in the demography to sit on the table and give you insights that no reports can give. Talk to the audience you want to talk to online. Sure, you might still not download Snapchat, but at least, you will be have the right context. d) Did you co-parent the content with your agency? Digital is not a marketing stepchild. For some, it can be the second sibling and for most it is the first child. Be a part of your agency’s thought process, and make them part of yours. Co-parent. It’s a beautiful way to grow your digital child. And I am not just waxing eloquence here. There’s ample proof of the benefits of such co-parenting when it comes to excellent online strategies. Just that. Jargon. Acronyms. Newer acronyms for the same old stuff. Totally avoidable stuff. When something doesn’t work in its current avatar, renaming it something else is going to be pretty useless too. Take our obsession to renaming cities. Where has that got us? Same universal principle, different industry. f) Data. Leave it, you are probably never going back there. Forbes put it succinctly, “Companies should only collect and store the data they need — and delete everything else. The value of data decreases very quickly, and storing it “just in case” is a dangerous path.” One that is long and dark. Insights, now that’s where we should be looking at. Really deep. So, I don’t mean to sound sad. It’s just that no one ever jumped with joy at a failure so we have this pre-set notion of being downcast about it. It’s the way life is. So how can what we do be different from the universal truths of life? It too shall pass. And when it does, you would have a stronger playbook to work with. Click Asia Summit 2016 will give you fresh insights into content curation and marketing with the who’s who of the digital world. If you wish to register for their workshops, please click here.